We do not curently have theatre tickets available for The 3 Little Pigs. This could be because we have simply sold out or it could be that this show is no longer running. The information on this page remains purely for historical and informational purposes. From the award-winning writers of the international smash hits Mary Poppins and Honk! comes a "great big little West End show" for audiences of three years and up. 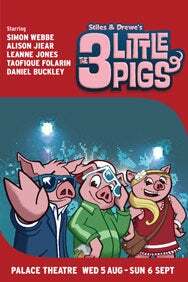 Stiles and Drewe's The Three Little Pigs, a very curly musical tale. He can huff and puff until the cows comes home, but will the Big Bad Wolf get the better of the three little superstar piglets in this brand new retelling of the classic story? Full of catchy songs, jokes and japes for little ones and parents alike, this endearing musical will leave you squealing with glee and howling with laughter.